On a September evening in 1973, the world of tennis changed forever. Record-breaking champion Billie Jean King enjoyed a straight-sets victory over the famously misogynist Bobby Riggs – magnificently torpedoing his claims that the women’s game was inferior to the men’s game. She campaigned for equal prize money, and was instrumental in making the US Open the first grand slam tournament to offer it. Riggs made his challenge to King after an easy win over that year’s World Number One player, Margaret Court. Riding high from a 6-2, 6-1 victory, he said he would take on any female player who chose to step up. 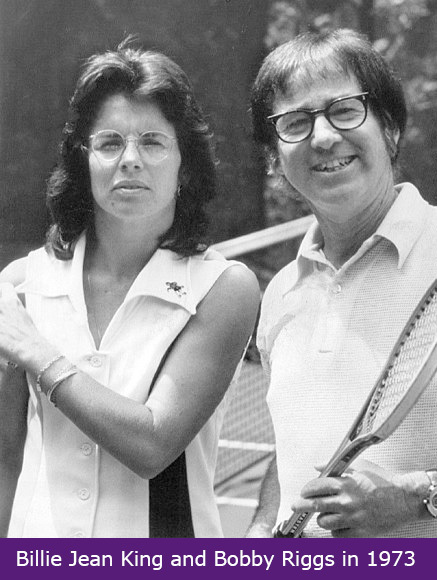 Billie Jean King, who had already turned down one invitation to play Riggs, rose to the bait. She accepted a lucrative offer to participate in the contest, which was screened on the ABC Network in the US and attracted a worldwide audience of more than 90 million people. After going a break down in the opening set, King won the match easily, 6-4, 6-3, 6-3. 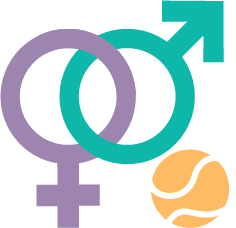 In doing so, she demonstrated not only that female tennis players were more than equal to their male counterparts. She also displayed the rare determination that had come to be her trademark. Born to an ordinary family in Long Beach, California, King (then called Billie Jean Moffitt) showed a prodigious sporting talent from a young age. Her father, a firefighter, was a talented basketball player, while her homemaker mother was a notable swimmer. King’s brother, Randy, played Major League Baseball for 11 years. According to her website, King knew what she wanted to do with her life the minute she picked up a tennis racquet. She wanted to be the best player in the world, and worked hard to achieve her ambition in some style, netting 20 Wimbledon titles, 13 US Opens, four French Opens and two Australian Opens. Her tally of grand slams was therefore 39, making her one of the most successful tennis players of all time. But it is the so-called Battle of the Sexes that most sticks in the memory. As a 29 year old, King knew she had the legs on her 55-year-old opponent. But, as his resounding victory over Court demonstrates, former World Number One Riggs was a credible player who naturally assumed the match would be his to lose. King was all too aware of this, and worked hard to prepare, physically and psychologically. When she dropped a service game in the opening set, she knew she had to turn things around. She did so in style and put the women’s game firmly on the map. Capitalising on her profile, King founded the Women’s Tennis Association (WTA) and served as its inaugural president. She campaigned for equal prize money, and was instrumental in making the US Open the first grand slam tournament to offer it. With the world at her feet, King had to deal with revelations concerning her private life. Her clandestine lesbian relationship with her secretary was exposed in a lawsuit, but it would be some years before King had the confidence to come out. Meanwhile, she lost all of her sponsorship deals and was forced to rebuild her reputation and career. It is a sign of both her dogged spirit and the liberalising of society that, now, King is celebrated for her work on behalf of the LBGTQ community. In 2009, she received the US’s highest civilian honour, the Presidential Medal of Freedom, in recognition of her achievements in this sphere. She continues to advocate publicly for gender equality and the equal treatment of all people, regardless of sexual orientation. For King to have achieved so much, on and off the tennis court, is a sign of her courage, determination and staunch belief in equal rights. That young girl who clutched a tennis racquet and dreamed of greatness may never have expected to go so far. Then again, given the unwavering self-belief that took her to the very top, perhaps she did.